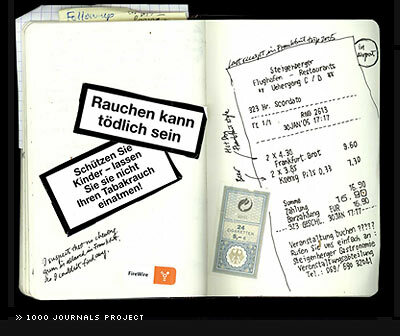 I carry a Moleskine around with me in my pocket wherever I go, every day. It's helpful for taking notes, jotting down ideas and thoughts to blog, writing reminders to myself, and drawing icons and other designs (I'll probably upload some pics of some of them some time, when I have a camera again). 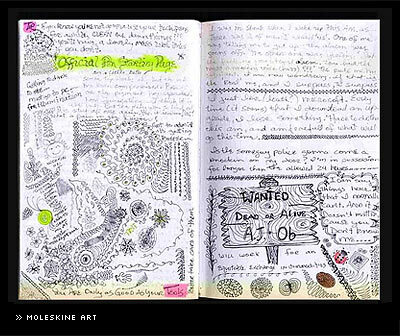 I never get as detailed and complex as some of these journals from the 1000 Journals Project, Book, and MoleskineArt. They're beautiful. Works of art even. Book is actually on display in a museum in Ireland right now. 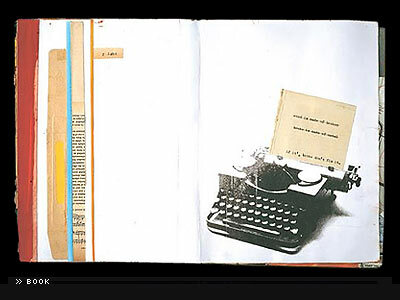 I've known some artistic people over the years who made great journals too. Aaron, Hilary, and Olya come to mind, and I've seen a few of Jason's jottings although never a whole journal. So this is an open invitation. I'd love to see photos or scans of your journal. I'll post ones I think other people will like too. Email me, or leave a comment if you don't know my email address.